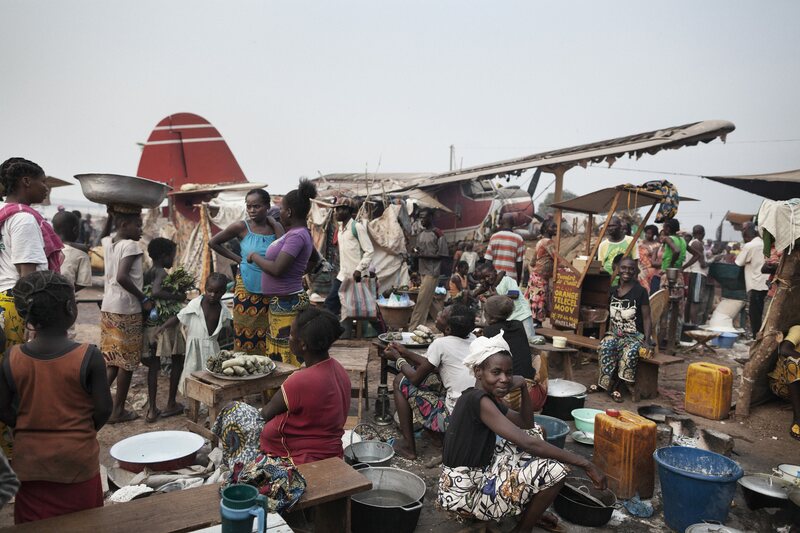 The New Humanitarian | Can $2.2 billion buy peace and prosperity in Central African Republic? Central African Republic, plagued by insecurity and a related humanitarian crisis, has been pledged $2.2 billion by international donors as part of a five-year rescue plan. It’s a lot of money, but will it really make a difference to the troubled country? The funding is a vote of confidence in President Faustin-Archange Touadéra, sworn in six months ago. In November, his government presented donors in Brussels with a peace and recovery plan to lift CAR out of the crisis it’s been in for at least the past three years, and arguably for the last two decades. The plan focuses on three broad areas: peace, security, and national reconciliation; revived basic services, especially education and health; and finally, economic recovery. EU foreign policy chief Federica Mogherini considered the Brussels meeting a success. “Our EU pledge today will support the efforts of the national government's ambitious reform agenda to give its population the peace, security and economic prosperity they deserve,” she said in a statement at the time. But arriving back in the capital, Bangui, Touadéra was more downbeat, warning that the spending taps were not about to open. “It is when we start projects that we will use these funds progressively to build schools, hospitals, repair roads and solve the displacement issue,” he said. Some CAR commentators were even dismissive of the amount pledged. As Joseph Bendounga, a former mayor of Bangui, told IRIN: in a country with a population of four million, the funding on offer works out at $500 per person. It’s “very little” he said, and pointed to the risk of corruption. But more money may not even be the priority right now. “This funding is only going to be effective if there’s security outside Bangui to allow humanitarians to do their work and to allow services to get up and running,” Human Rights Watch researcher Lewis Mudge told IRIN. CAR is in disarray. The state is weak, and large swathes of the country are controlled by armed groups. Violence and intimidation forced humanitarian agencies to suspend work in the central town of Kaga-Bandoro in September. According to the UN’s emergency aid coordination body, OCHA, some 2.3 million people out of a population of 4.6 million are currently in need of aid; 385,000 people have been made homeless; and 452,000 have been forced to flee the country. Fighting has been ongoing since December 2012, when a coalition of rebels known as Séléka, claiming to represent the country’s aggrieved Muslim minority in the northeast, fought their way south to Bangui. Their indiscriminate killing and looting triggered retaliation by an umbrella of largely Christian vigilante groups known as anti-Balaka. The country remains split along sectarian lines, as armed men exploit their power to extort civilians, and engage in brutal revenge killings. Séléka is a coalition rather than a united front. In late November, fighting between two Séléka factions in the central town of Bria left at least 14 civilians and 115 combatants dead. The battle was over control of the road – and therefore “taxes” – to diamond mines in the region. In a country that is sorely underdeveloped, with few regular job opportunities, its abundant natural resources are worth fighting over. “[The warlords] who benefit from the conflict need to stop,” Joseph Bindoumi, president of the Central African League for Human Rights, told IRIN. The inability of the 246 UN peacekeepers stationed in Bria to protect civilians has added to the growing criticism of the MINUSCA force. It was yet another example of the peacekeepers’ perceived passivity in the face of real opposition. On 12 October, Séléka attacked a camp for displaced people in Kaga-Bandoro. They stabbed and hacked to death people in the camp who had already been made homeless by previous violence, despite the presence of a contingent of peacekeepers. In an angry demonstration in Bangui weeks later demanding the withdrawal of the 12,870-strong MINUSCA force, four people were killed. It’s unclear if the protestors shot by Burundian peacekeepers were armed. Insecurity is tied to impunity. “[The warlords] are in such powerful positions, there is no benefit for them to stopping or stepping down. They lose their tax base and they lose their protection,” said Mudge. The withdrawal of French troops who intervened under operation Sangaris, and along with African Union troops stabilised Bangui, is another question mark over stability. Mudge believes that a case can be made for a more robust UN deployment, similar to the Force Intervention Brigade in the Democratic Republic of Congo, where elite units backed by attack helicopters scored initial successes against M23 rebels. A priority for the government has been to negotiate the disarmament and reintegration of armed groups. The country has been here many times before in the course of its violent past, and the talks are currently stalled over demands by the warlords. Some Séléka are calling for partition, while the anti-Balaka want assurances they will be integrated into the army and consulted in government decision-making – demands the government will not agree to. But Touadéra, a former maths professor, lacks leverage. The country is under a UN arms embargo, which includes what remains of the national army. An exemption has been made for two battalions being trained by the EU, but they won’t be up and ready until next year. In the meantime, the insecurity is undermining his popularity.